Yellow Red Emelgem is a Belgian team managed by LongCat and is currently playing in the VII.495 series. From the very beginning until 24-08-2009 the team was called S.K Oostnieuwkerke. The manager of Yellow Red Emelgem is LongCat. More about him can be read here. Kaan Çatkaş ( ) is the headcoach of Yellow Red Emelgem since their promotion to the 7th division. His assistent is Jiří Šiška. Bobby Meuleman is the youthtrainer since his retirement from the A-squad in August 2008. Coach: Rudolf Pauwels ( ): He became the first coach of S.K Oostnieuwkerke and brought SKO close to promotion to VII. He retired with only a few games left. He now works in Italy. Coach: Matthias Schrittwieser ( ) took over Rudolf's job with promotion to VII in sight. He trained the players for 5 seasons and took them to sixth division. Coach: Lauri Ketonen: Lauri left the team after promotion to the 7th division was assured. While he was the coach the team relegated twice and promoted once. In the series system, Yellow Red Emelgem is known as a team that managed never to finish lower than the 3th place in their first six seasons! After that, the manager took the decision to stop playing for the good results. Even in the cup, Yellow Red Emelgem always manages to do something special. Most of the times Emelgem is the first team in their series to be eliminated from the cup, mostly by a lower-ranked team. SKO didn't play in the cup this season. S.K Oostnieuwkerke was founded on 24-04-2007. Four games of Season 19 had already been played and the team was in eighth position with only 1 point. The first games where immediately very crucial as SKO played against the two teams in front of them. 2 weeks, 6 points and 11 goals later, S.K Oostnieuwkerke was the new number five in their series and now had to play against the leader two times. For a beginning team, they did very well and only lost their away-game with 5-4 after a late goal. The return was won 3-2 after a great first period. The rest of the season was pretty easy and the result was that SKO was the number four with only one game left. The impossible happened! SKO won 0-6 against the number two while the number three lost against the champion. The result of this was that there were three teams with equal points but Oostnieuwkerke had scored the most goals and finished second. In the cup, SKO decided to play MOTS but still lost 0-4. Everyone thought their season was lost before it had even begun. The target in season 20 was very easy. As SKO managed to finish very high the previous season, while they only played 10 games, the league title was the least they expected. The season started very well with an easy 0-6 victory but in week 2 it almost went wrong. The manager decided to play PIC and almost lost points due to this. Fortunately, Bobby Meuleman was still there and saved his team in the last minute of the game. The rest of the season, nothing spectacular happened. SKO kept winning and even their largest competitor couldn't stop our boys. Oostnieuwkerke was already assured of promotion and the league title, when they finally lost points in the last match. Just like the season before, the first cup game was lost 0-4. Fortunately, the manager didn't decide to play MOTS this time. The first season in 7th division, started with a big disappointment. Due to a bug in the game, it was already know that SKO lost 0-2 against the other promoted team, even before the match was played! The next weeks, SKO varied wins against weaker opponents with draws against their real rivals. This resulted in a 3th place at the end of the season. This season was the season SKO wanted to build a team with which they could play for promotion the next season. Results weren't that important and that was noticeable on the pitch. SKO only managed to get one point out of the first three games before they finally won the clash of week 4 with 2-3. This was the start for the team. They didn't lose for 10 weeks and eventual finished on the 3th place again. Building a stronger team was again the task for this season. Results were, again, not that important and, of course, again that was noticeable on the pitch. With only 25 points, a goal difference of 30 and, again, a 3th place this was clearly the worst season in 7th division. Again, the first cup round was survived. This time the end was in the second round after a PIC victory against a BOT-team and a heavy loss. As the manager started to enjoy VII.550 and he realized his team wasn't ready yet for the 6th division, he decided he wanted to stay there for at least another season. But SKO was too good for that. The opposition was humiliated in the first round and eventually SKO missed the league title with only one point and finished second. Although, the promotion to the 6th division was there. After this season, when the manager saw his new series, he wasn't very happy. While his team only had a rating of 140, all his opponents easily reached 180. This was the signal for King_Of_The_Dust to take a strange decision. A new disillusion in the cup this season. SKO was the better team but couldn't do a thing against the MOTS of the opponent. A new elimination in the first round, the 4th in 6 seasons. SKO was eliminated from the cup so KOTD could make his decision true. All players came on the transfer list and less than a week later, a new S.K Oostnieuwkerke was born. It existed of trainees completed with 17yo players that could hardly play football. Also, a new logo claiming SKO is the best BOT-team in the world was added to the team page. The result weren't very surprising. SKO lost every game (heavily) against teams with a manager but surprisingly, SKO managed to stay in sixth division as there were two BOT-teams in its series. On the 12th league day, the manager became a little infamous in his series. Against a stronger opponent the manager decided to neglect defence and offence and just tried to get the midfield as high as possible. He managed to have 70% of ball possession and the game ended 1-1 (214713043). SKO finished 6th and could stay in the sixth division for at least another season. Just like the previous season SKO had to play against a MOTS in the first round of the cup. The 'everything on midfield'-tactic couldn't help. The game finished 2-1. The season must have been very boring to follow for the fans that showed up every week, but the manager enjoyed it a lot. Oostnieuwkerke started the season with 10 defeats in a row before using its famous 'all on midfield'-tactic in week eleven. 2-2 was the result and SKO finally had its first point. Unfortunately, relegation was already certain by then. The season started on the 8th place and... it ended there. Which meant we had to go back to 7th division. Season 26 was also the season in which SKO surprised its supporters by buying two Surinamese players. Dean Wijks became the first international only one week later. Another important fact about this season is that is was the season in which the board started to talk about a new name for the team. Yellow Red Emelgem was chosen and it will be used from next season on. Rosebery Park is named after an area in Tasmania, Australia. This name also has a meaning. The warm weather in Australia could be compared to the warm atmosphere at Rosebery Park. The nice people can off course also be found at our ground. Only the kangaroos are missing. 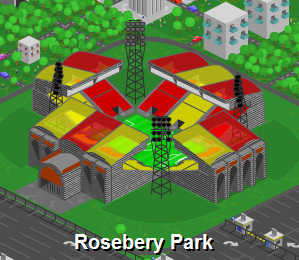 Rosebery Park was built during season 32. At the time there were only 12.000 seats. VIPs often had to stand between the ordinary supporters as there weren't any VIP-boxes. At the beginning of season 34, Rosebery Park was extended to 15.000 seats. Only 1.5 seasons later, the next extension was there. 22.533 seats was the new capacity. During season 37, construction company Klopterop was asked to extend the stadium to 35.000 seats. Beside the usual tournaments (cup, league) Yellow Red Emelgem sometimes takes part in some other tournament. Mostly these are Federation-clashes or federation-cups. 05-09-2007: Beltrick Mega Cup: SKO was bye in the first round and had to play against the leader in fifth division for their game in the second round. The coach didn't expect a lot of this match and decided to give the youth a chance. This proved to be a terrible mistake. 2-2 was the score after 90 minutes but then experience started to make the difference. SKO lost 2-3 after extra-time. 20-02-2008: PBFNB-clash: For the clash against the Flemish Football Federation, SKO had to play against Royal Apen FC. As expected, the visitors won 2-4. The PBFNB lost the clash. 11-06-2008: HAG-clash: As a last test before the new season started Oostnieuwkerke had to play against a team from the Dutch ninth division. This match was the first match of the whole clash. SKO won 5-0 and HAG won the clash. 25-03-2009: HAG LAG Cup 2: In this cup the objective is to lose your games. SKO won their first two group matches and lost the last match 3-1. This meant Oostnieuwkerke proceeded to the next round with only one goal difference. In the quarter-finals Oostnieuwkerke lost 2-5 against a Dutch opponent. The semi final was against Azzato's Mighty Heroes, who had lost the first game earlier in the tournament. After a heroic battle, which resulted in two injuries, a red card and Oostnieuwkerke finishing the game with only 8 players, SKO lost 4-5 and proceeded to the final in which they had to play against Hammer!, another Belgian team. Unfortunately the Final was lost 3-2. 13-05-2009: HAG-clash: As usual SKO played the first game of the clash. This time they lost 0-5. HAG won the clash. 02-09-2009: PBFNB/PF-clash: The clash was between the PBFNB and the Positiespel Federatie. As manager KOTD was a member of both federations he had to choose and chose for the PF. He lost 8-0 against Acts United FC, the team of oldtrafford. With this, he became the worst competitor in the clash. By playing in VII.550 for 4 seasons, S.K Oostnieuwkerke became the best team ever in that series. This page was last edited on 24 May 2010, at 22:08.